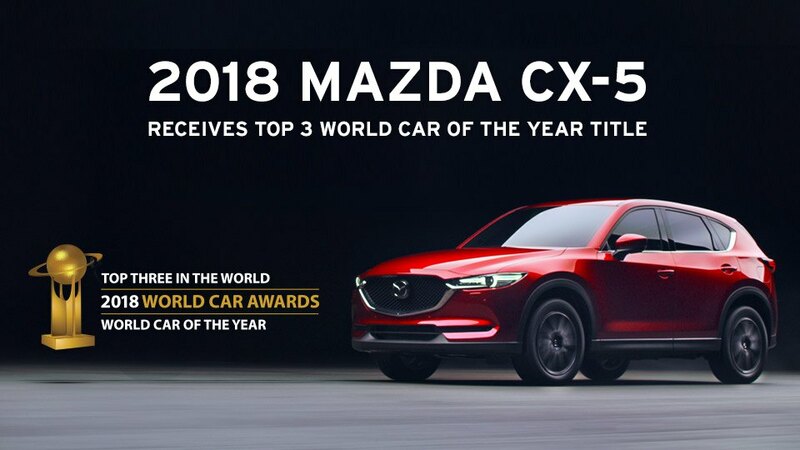 The 2018 Mazda CX‑5 Receives Top 3 World Car of the Year. The 2018 Mazda CX-5 was recognized by The World Car Awards as one of the top 3 cars in the world for 2018. The CX‑5 comes equipped with cutting-edge technology such as G‑Vectoring Control and i‑ACTIVSENSE safety technology for an enhanced driving experience. As the first Mazda built with our groundbreaking SKYACTIV TECHNOLOGY, the CX‑5 has been fine-tuned since its launch, delivering even better responsiveness and control. This award not only recognizes the quality craftsmanship of the CX-5 but also the passion of our engineers and designers to create vehicles that engage drivers tactically and emotionally. Read more about the 2018 Mazda CX-5 recognition at the World Car Awards.